Creating a new record on back of market demand, Honda 2Wheelers India today is the NEW NO. 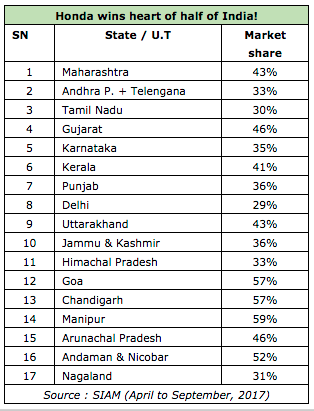 1 One choice of two-wheeler customers in more than half of the Indian 2Wheeler market. Honda is now the No. 1 two-wheeler brand in 15 States and 2 Union Territories of India which together account for a massive 52% of all two-wheelers sold in India. 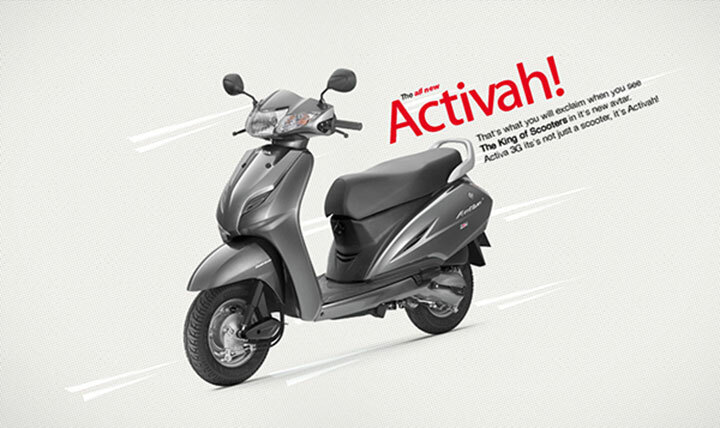 Noteworthy that Honda has gained a quantum leap of India’s love and trust in only 6 years. Honda’s market leadership has exponentially grown from just 1 state & 1 Union Territory in 2011 (Arunachal Pradesh and Goa) to 15 States and 2 Union Territories in 2017. Led by our deep understanding of customer needs of today and dreams of tomorrow, Honda has been expanding opportunities to win the heart of Indian society. We have invested with speed and aggression to meet demand for quality Honda products. In just 6 years, Honda has expanded from one to four plants, launched new exciting models and tripled our network reach. We thank our valuable customers in India who are fulfilling their dreams while riding a Honda two-wheeler and will continue our endeavor to win more hearts going forward. Honda has changed the way India rides a two-wheeler. While becoming the first choice of the progressive states, the next wave of demand growth for Honda is coming on back of increasing scooterization of traditionally motorcycle driven states. Be Uttar Pradesh, Rajasthan, West Bengal, Bihar, Odisha, Jharkhand or Chattisgarh, scooters are the fastest growing segment in these states. Along with expanding our network, we aim to reach last mile with availability of our products and services. We are confident to drive this scooterization while consolidating in the motorcycle segment as well.